A railway line in north Wales which has been blocked since it was damaged by Storm Doris in February will remain closed until mid April. Network Rail needs to remove 300 tonnes of rock from the rock face along the Blaenau Ffestiniog to Llandudno branch line for it to be safe to reopen. 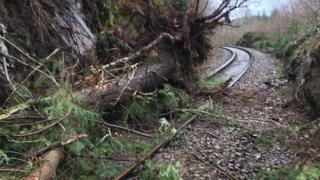 The Conwy Valley line was shut after a large tree fell onto the track between Llanrwst and Blaenau Ffestiniog. A replacement bus between Llandudno and Blaenau Ffestiniog remains in place. Engineers have been scaling the rock face to remove "disturbed vegetation and unstable rock formations". "Due to the limited accessibility of the site, with a single track railway and no road access, engineers have been unable to use machinery typically used for similar repairs," a Network Rail statement said.